I am pleased to announce I will be running a one day sketching workshop in partnership the Honey Pot Arts and Crafts on Sunday July 26th. Based in Ratho at the Edinburgh International Climbing Arena, the Honey Pot studio is huge, full of arts and crafts and with double doors to a secluded garden (within a disused quarry! ), means this workshop will be able to include both outdoor and indoor sketching . 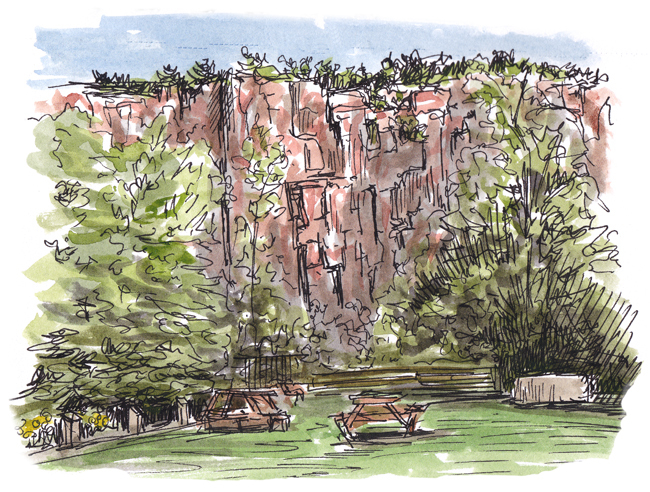 The above sketch is from the garden, showing the impressive quarry rock faces that surround the EICA. So join me for 2 hours of sketching , lose yourself in a world of crosshatching and watercolour. We will forage items to draw from the garden and create beautiful compositions. Through short timed sketches and fun activities you will relax into your art and discover a natural ability to record what you see in just a few strokes. We’ll discuss and compare the artwork before mounting our favourites to take home. 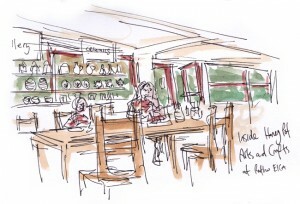 Below is a sketch of the interior, crammed full of ceramics, glass work, jewellery and other on going creative projects. Both sketches are in black ink with a watercolour wash.
Zoë Furnivall liked this on Facebook. Vimi Lomax liked this on Facebook. Cerys Trayner liked this on Facebook. Valerie Russell liked this on Facebook. What better than a couple of hours drawing in beautiful surroundings?! Emma Walker liked this on Facebook. Juliet L Russell liked this on Facebook. Anna Gausden liked this on Facebook. Karen Minnis liked this on Facebook. Suzanne Downes liked this on Facebook. Sáras Feijóo liked this on Facebook. I’ll just make a retinal imprint! Can we keep this for Monday morning?